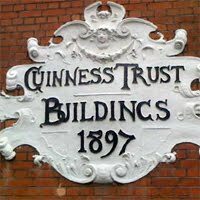 In 1890 Edward Cecil Guinness (1847-1927), great grandson of the founder of the Guinness Brewery gave £250,000 to set up the Guinness Trust. Guinness’s purpose was to help the many people in London and Dublin who found themselves destitute and unable to afford decent homes. The first trustees were concerned with more than just housing as they provided heated clubrooms, hot water and bathing attendants. The Trust manages 626 homes in its Brixton and Kennington estates alone.